I’ve never really read the ‘darker’ side of fairytales before, like Brother’s Grimm, but I am familiar with most of the story lines. They fascinate me and I’ve been meaning to read them. 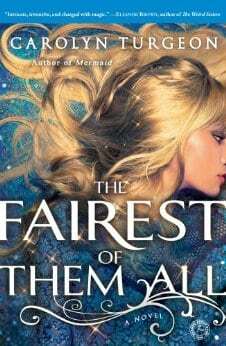 The Fairest of Them All was a great way to enter this darker world because it wasn’t too dark, but it definitely had that darker flare. The story is told by Rapunzel. I honestly wasn’t sure how Turgeon was going to pull off combining these two fairy tales, but the way she did it made it feel like they have always gone together. There are so many little things that Turgeon covers that helped clarify the original fairytales, or at least the Disney version that most people are familiar with. For example, I never understood why Snow White’s step mother would ask the wood cutter to kill Snow White and bring back her heart in a box. It just felt gruesome to me. Why would the Queen want her heart? The Fairest of Them All answers that question and almost makes it seem like a perfectly reasonable request. Almost. Turgeon also explains so many other things with the creative liberty that she took, like why the Queen, Rapunzel, is obsessed about being the fairest one of all. Or why Rapunzel had magical hair. Or how Lady Gothel came to have Rapunzel out in the woods to begin with. I couldn’t help but like Rapunzel at the beginning. She was so sweet and innocent and very naive to the way things worked. I thought that I would like her less as the story progressed, knowing how she would turn out, but I never did. I just hurt for her, which surprised me. I was also pleasantly surprised by the number of plot twists that I wasn’t expecting, but they all made sense and didn’t feel forced. You can’t help but get pulled into this enchanting world. It’s definitely one I’ll be returning to again and again. This is a fascinating book about the two fairy tales and how they are put together. I would like to read this book and see for myself how the story begins and ends. Sounds like the writer did a good job. This sounds like a fascinating book because it so effortlessly combines two fairy tales and explains all the twists and plots. I think my wife would really enjoy this. I have recently read several romance novels with a fairy tale theme, and I enjoyed that theme a lot. Even though this is not a romance, I am still intrigued by the storyline. Interesting sounding book, I’ll check it out on Amazon, thanks for the review. It’s sounds like the kind of book that I will like!